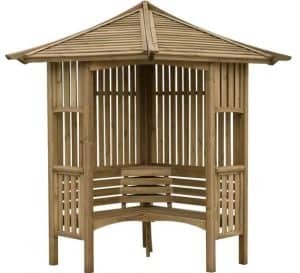 Now you can fill that empty corner in your garden with the Solway Wooden Corner Arbour. 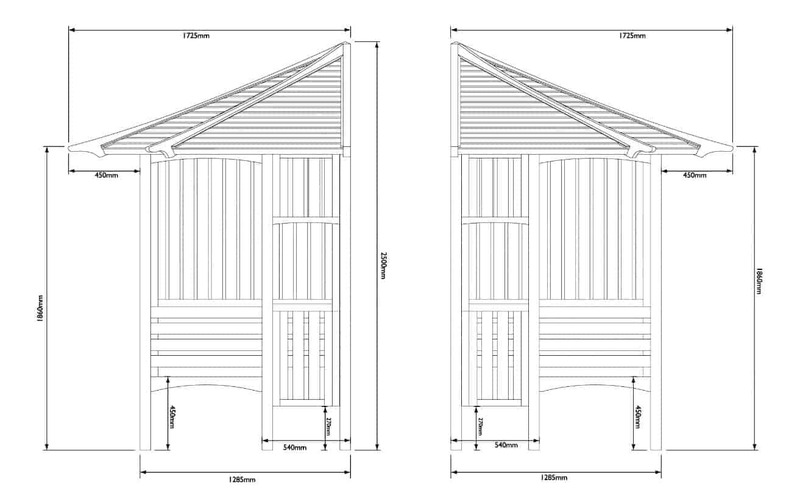 It is constructed from pressure treated softwood and is a gorgeous slatted piece with a conical roof. Comfortable enough for 2 or 3 people to relax and enjoy a glass of bubbly and have a few laughs. Or you could sneak away, have a sit down with a cup of coffee and enjoy a book. It’s the perfect place for some time out from the outside world where you can just escape to your own little world. Blooma are well known for their incredible arbours and this one here really does show why they are so highly thought of. 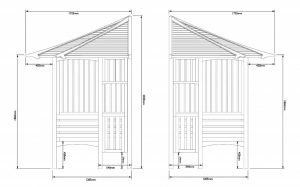 From the incredible slatted panels which allow you to add hanging plants to the strong framing that makes it a very sturdy structure. This is one arbour which has been very well made and built to last. No matter if this is sitting in the corner of your garden, kind of hidden away so that it is your own secret relaxation place or if it is right in the middle of the garden out in plain sight for you and your friends to enjoy together it is going to be something that gives you many years of good use. Once you sit down, you will not want to get back up! 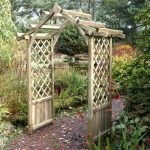 Finding that perfect thing to finish of your garden can be a little on the tricky side, but we feel that this gorgeous, Blooma Solway Wooden Corner Arbour would do the job perfectly. 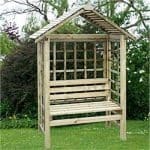 This is a corner arbour and we do feel that it would look very nice sitting in the corner of your garden, but this would actually fit in pretty much anywhere in your garden. It has a lovely design and it really is quite eye catching, even in its unpainted form. It is also a very reasonable size. The width and the depth are both 5 feet 6 inches and this makes this a good sized arbour, without it taking up a whole lot of space. The height of the structure really does make it quite eye catching as it is a little over 8 feet high. Unlike many other arbours, this one here actually does offer you a bit of protection from the rain as there is a very well made roof. This is an apex roof that is done in a conical style which makes it look like something that would be sitting in the grounds of a castle. We have seen this a few times from Blooma and it never fails to impress. The walls of the arbour are very well made and rather than using full boards which let’s face it would be rather boring, Blooma have used open slatted infill panels so you could use some climbing flowers. We have seen some other arbours that go for a criss cross design here, but we actually really like what Blooma have done here as it gives it a more solid look and feel. If you take a closer look at the pictures then you can see that the framing which keeps this structure together is very well made. It is thick, strong and is going to make it so this arbour can be used for many years. It even makes it so it can take the abuse from the kids as they jump off and on it even though you have told them at least 500 times not to. 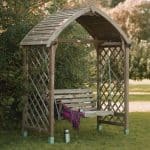 What is the point in having an arbour in your garden if you are not going to take the time every once and a while to kick back and enjoy a little rest in it? Well the seat that this arbour has is very impressive. It is a good size and it actually goes from side to side with no little gaps at the edges. This means there is no wasted space and you can fit a couple of friends in here with you to have some laughs and a few drinks, or you could just sit in here yourself with a book and your feet up. The seat being the size that it is, is one of the features we like best about this arbour. Blooma make sure to pressure treat all the timber that is used in their arbours and this is one of the things that make them one of the best arbour manufacturers out there. It really does give the arbour a great start to its life and will ensure that wood is strong for many years. Still, we would always recommend that you give the arbour a coating of wood treatment to give it the best possible protection from rot. 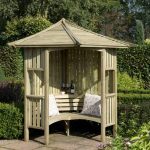 The Blooma Solway Wooden Corner Arbour comes with a five year guarantee which is more than fair. While we have already said how the actual seat is a good size, the actual seating area of this arbour is very nice and makes this the perfect place to relax. At the back there is this little area where you can sit your wine bottle, cup of tea or even the iPad if you fancy listening to music or watching a movie outside. If you are building this on concrete or on a decking area then you could also put things under the seating area as there is a decent amount of space here. The last thing you want when you sit in an arbour with a nice cup of tea and a good magazine is for it to feel flimsy. Blooma have done an incredible job in making sure this is one very stable and secure arbour. The solid framing and the fact the wood has been pressure treated do give this a very solid and high quality feel. By using open slatted infill panels, you can if you are a person blessed with green fingers hang some flowers here or you could even hang some wind chimes or some other decorative piece from the roof. There is just so much you can do with this arbour that it really is going to let you flex your creative muscles. At the same time this is something that looks fantastic just as it is so no matter what you decide to do, we are sure it is going to look incredible in your garden. Blooma do not offer any extras with this arbour, but we suggest making sure you have a bottle of wine on standby so you can get in here, put your feet up and relax as soon as you have installed it. 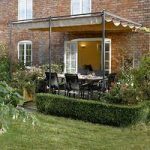 Not only is this one very attractive looking arbour it is also one of the most solid and well made arbours that we have ever seen. They have just done such an amazing job in making sure the wood used is thick and strong that it has a high quality feel all throughout. This is something which you are going to be able to enjoy for many years. With the wood being pressure treated it is made to last, plus if you do give it a coating of treatment then you will never see any signs of rot or decay. This is a very decent size, being able to fit you and a few friends, you and the kids or just you with your feet up. We love how it does not take up a whole lot of space, but the height of it really does make it one impressive looking structure. You will need to roll your sleeves up, get the tool box out and possible the first aid box as well. But this is a DIY job that is not all that difficult and by following the instructions, you will be looking at around 4 hours at the most. This may be priced a little higher than other similar sized arbours, but you are paying that extra money for the high quality. This is an arbour that you are going to get many years out of so we do think the price of it is reasonable. Final Thoughts: We love the Blooma Solway Wooden Corner Arbour and as a matter of fact if we would have a bunch of these in the office to sit and work on, we would. But being serious this is something which we are certain anyone who buys is going to be very happy with. It is just so well made and it has such a charming and fantastic look that it is near impossible to resist the temptation to have a sit down for five minutes, even when you are supposed to be outside cutting the grass, you will want to have a little rest on here. 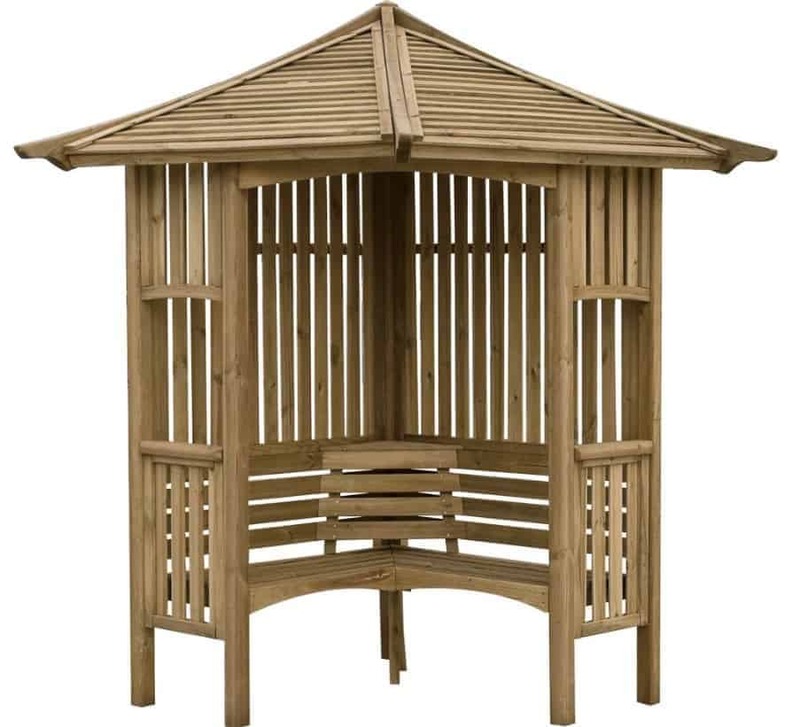 As a place to relax or just as that extra something to finish off your garden in style, this arbour would be perfect and is something we highly recommend.